There are three famous hotels on the Egypt “Grand Tour”. 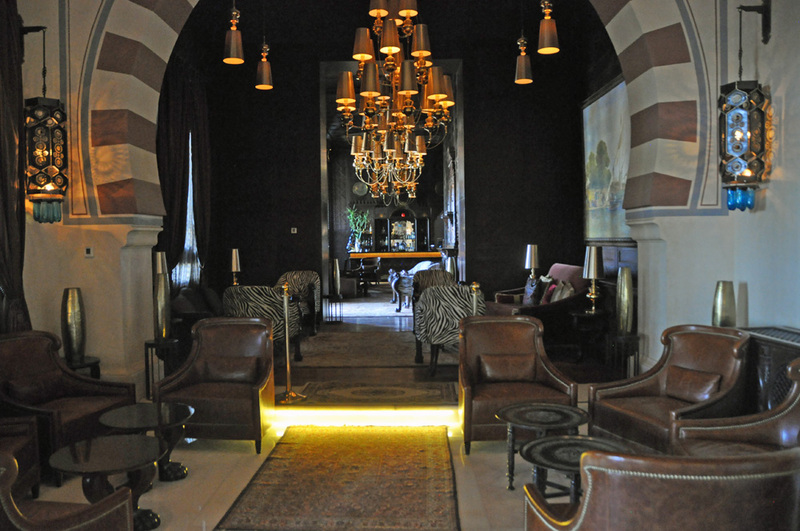 Mena House at Giza, The Winter Palace Hotel in Luxor and the Old Cataract Hotel in Aswan. All with great history a long catalogue of their rich and famous guests who journeyed through Egypt’s treasures over the last 150 years. 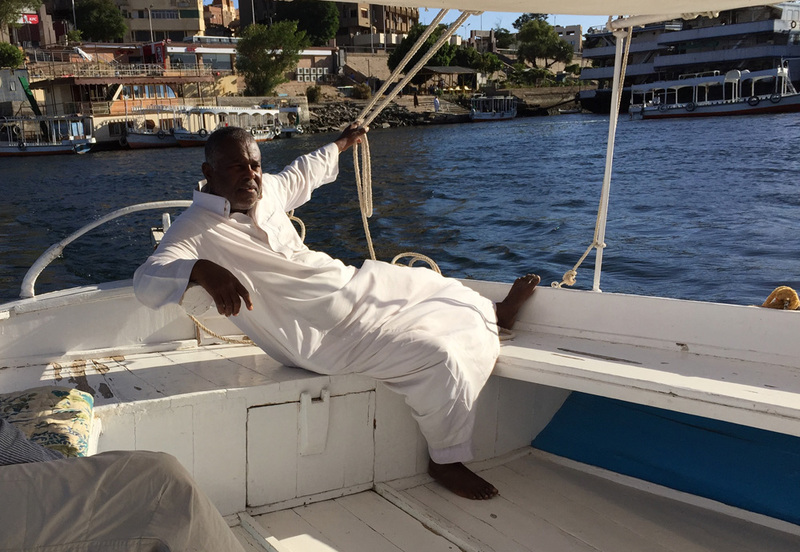 Mostly their settings are stunning, the latter two right on the Nile. 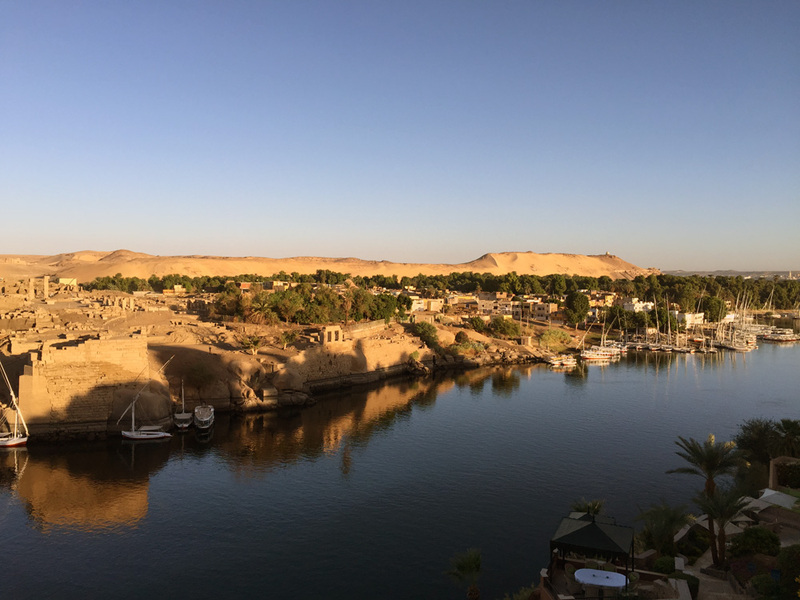 The problem at the moment with the Winter Palace is that it’s right in the middle of Luxor where, as soon as you venture out, you’re assailed by every kind of street vendor; get’s bit wearing and much better to stay at Beit Sabee [see post]. Well, it’s nearly true. 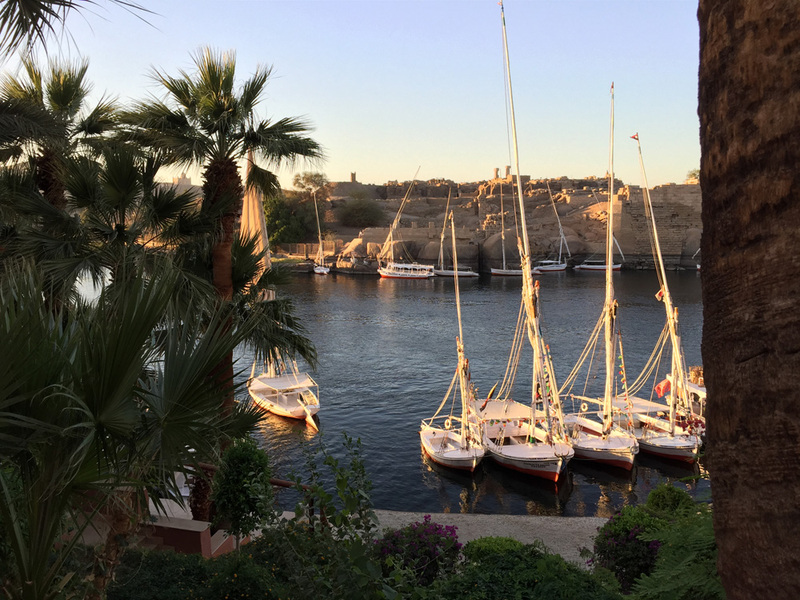 You have a panoramic view of the river to left and right, views across to Elephantine Island with its Nubian Village, the hills and desert beyond with the Aga Khan’s mausoleum. Quite breathtaking and, although balcony is a tad on the small size compared with Agatha Cristie’s one next door, it’s big enough so watch the river traffic [though there’s not much at the moment] and see the sunset across the river. 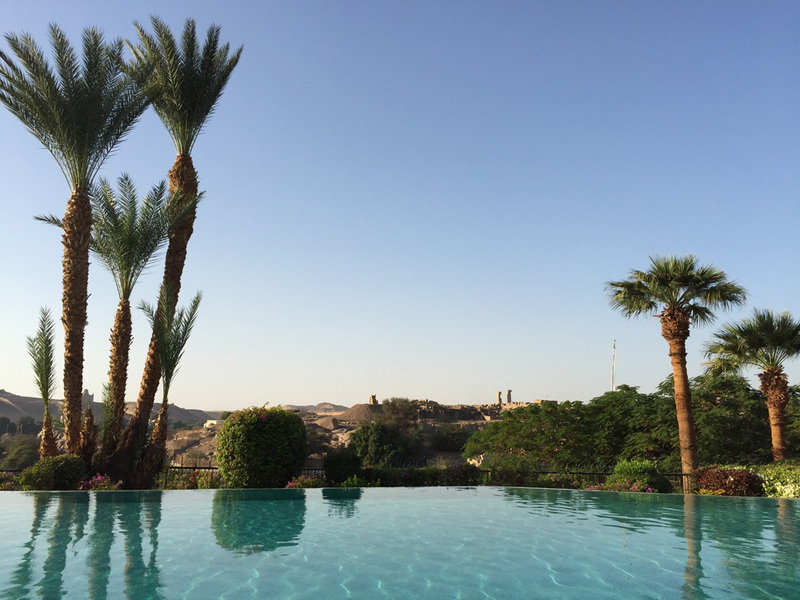 Like the rest of our experience in Egypt, the hotel was very quiet – deserted almost. We ate a couple of times in the Kebabgy Restaurant beyond the pool and there was us and another couple – that was it. There are three restaurants, including the signature 1902 which has an international tasting menu. The prices are much more european than Egyptian and are a stark contrast to the wages and prices outside the hotel’s secure grounds. Best to take a short walk outside along the Corniche and negotiate for your falucca directly. You can easily walk to the Nubian Museum, which was excellent, and it’s a short car ride to the Philae Temple ticket office. 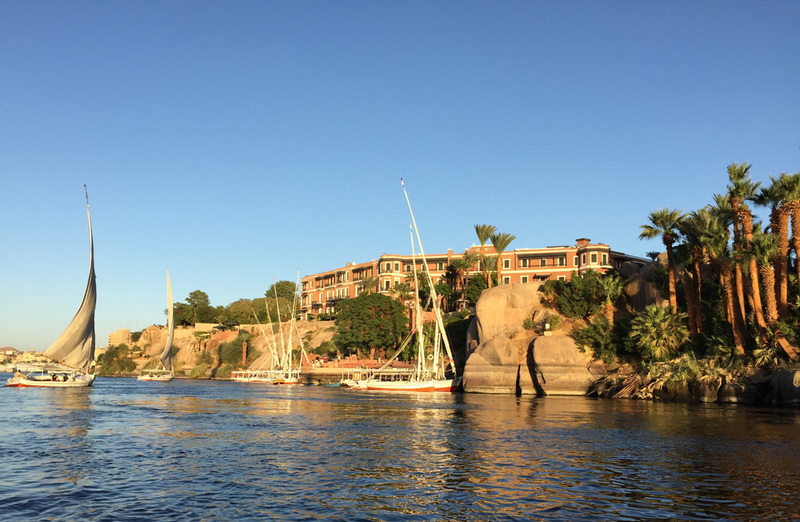 For lunches we opted for a couple of local restaurants – Panorama and Aswan Moon. Mostly deserted apart from a handful of locals. The food was excellent, with vegetarian dishes readily available but no alcohol. We paid around £4-5 for two people for two courses including water, tax and service. Twice that wouldn’t buy you a glass of wine in the hotel. The hotel is, of course, run by an international chain – it couldn’t keep going on such terribly low occupancy if it wasn’t – so all the prices are very nearly what you’d pay in England. The reception and concierge staff were endlessly helpful, the waiting staff perhaps still in training. Overall a magical setting in a building steeped in history.